This documentation covers the actions that we support via YouTube. 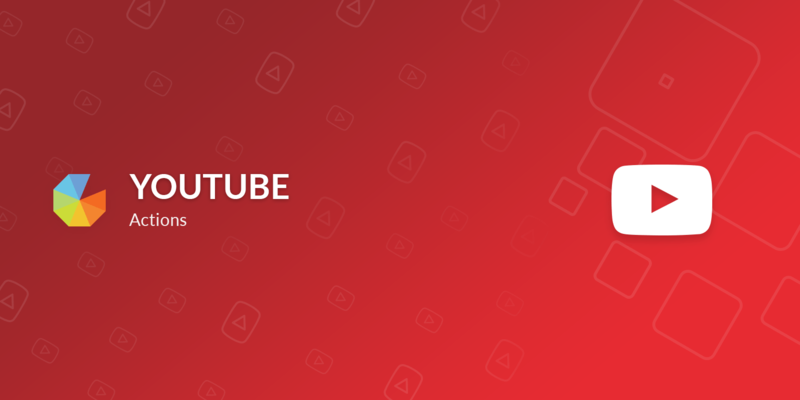 If a user connects their YouTube account or performs an action that requires authorisation, then they will be required to authenticate with the Gleam Competitions YouTube app. Please note, these are the default permissions for any app on YouTube. Gleam will not do anything via the API without your explicit click or permission whilst entering a campaign. Verifying Subscriptions and Commenting will ask for extended account permissions. 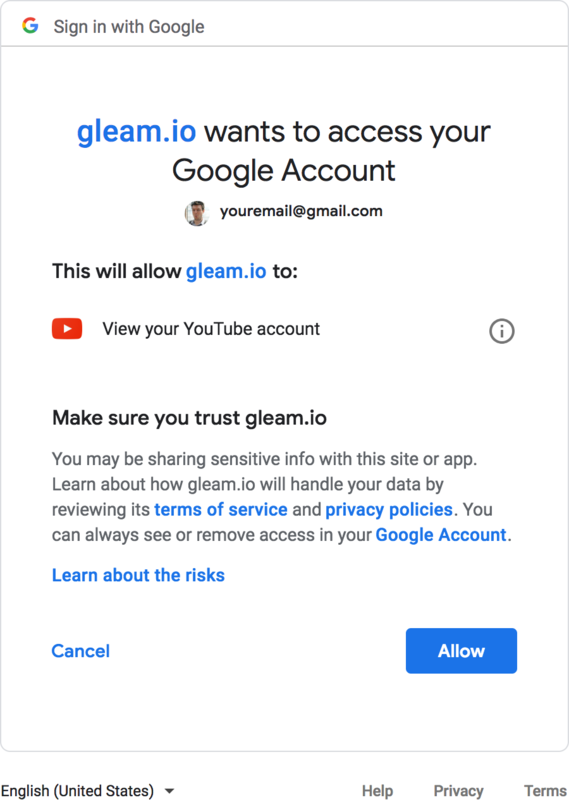 Gleam supports the ability to login with YouTube as an action type. This means you can open up a competition to any YouTube user, simply add it as an action type & once they login via YouTube they will get an entry. This also has the added benefit of letting you see (and verify) your entrants YouTube Channel URL or @username. The YouTube Submit action allows you to ask users to submit any YouTube video as an entry into your contest. It's possible to link these videos to a Gallery (if you wanted to run a video submit competition) and let users view and vote on them. 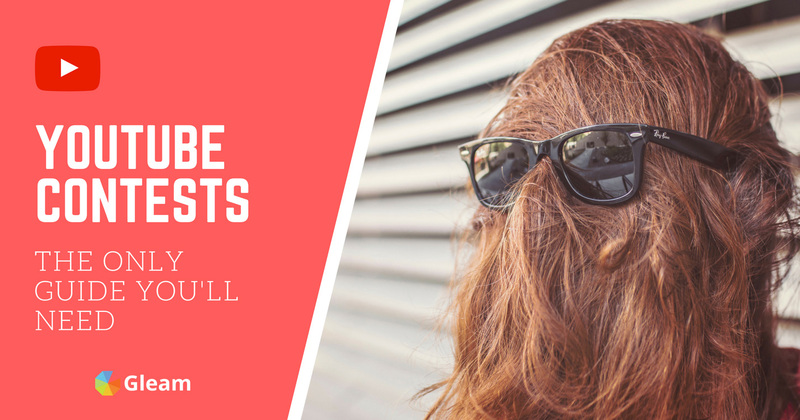 The YouTube Visit allows you to send users from your campaign to your YouTube Channel. This action does not incentivize Subscriptions, in order to comply with YouTube's Fake Engagement Policy the user must choose on their own whether they like your content enough to Subscribe. When setting up the action you will need the URL of the YouTube Channel. The Action will accept the User URL or the Channel URL. Users cannot complete the action until they visit the YouTube Channel. If you use Require Auth during setup then we'll also ask the user to login with Facebook once they hit complete so you can verify their identity when drawing winners. This Action is not longer available to help creators comply with the YouTube Fake Enagement Policy. We've created an example competition that you can play with, it contains all of the actions that we've covered in this guide. We have a number of other resources and guides that can help you get more out of your YouTube contest with Gleam.